Home » Attendant » CENTRAL GOVERNMENT JOB » CENTRAL GOVT. INDIA » Haryana » Medical Officer » Research Officer » Walk-in-Interview » Various Jobs Vacancy Walk-In-Interview Posts in Translational Health Science and Technology Institute at Faridabad. 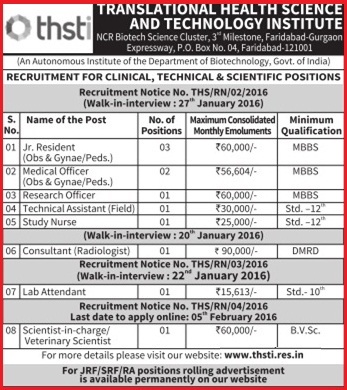 Various Jobs Vacancy Walk-In-Interview Posts in Translational Health Science and Technology Institute at Faridabad.